Currently viewing the tag: "2014 International Book Awards"
I appreciate the quote “Do something today that your future self will thank you for.” I’d like to credit the person who said it but alas, though I can find many people citing it, I don’t see it attributed to anyone other than “unknown.” It’s a good one, however, and I not only say it, I live by it. Any of my colleagues will tell you that the act of writing is a solitary one. It can be evolutionary, reflective, demanding, passionate, heartbreaking. It takes years and mistakes and drafts and negative feedback and shamelessness to complete a manuscript. But that and even more –a determined commitment — to see it through publishing with the sad knowledge that no one may ever actually read your words. It demands backbone and resilience to weather the rejection, criticism and reviews, if you even get there. Though touting my wins may be annoying to some and sound as if I’m bragging about the achievement to others, I hope that serves as inspiration instead. It’s these rare acknowledgements that make an enduring commitment to creativity, art and the desire to say something feel like it hasn’t been a total waste. Love me, hate me — no one else is going to announce it for me. Ellen Reid at the National Indie Excellence Awards said in her letter, “Your book truly embodies the excellence that this award was created to celebrate, we salute you and your fine work.” I will nestle her words close to my mountain of rejection letters. 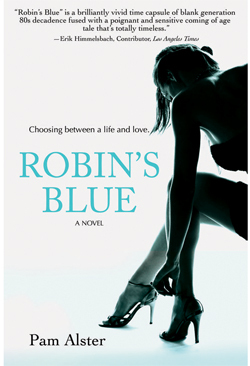 So, thank you to the 2014 National Indie Excellence Awards, the 2014 International Book Awards, the 2013 USA Best Book Awards and the Kindle Book Review Awards for your recognition for Robin’s Blue. Now I will return to my seclusion and continue to throw mud at my next attempt to say something. Robin’s Blue by Pam Alster named 2014 Award-Winning Finalist in the “Fiction: Chick Lit/Women’s Lit” category of the 2014 International Book Awards.